Here am back with yet another delicious rice recipe. 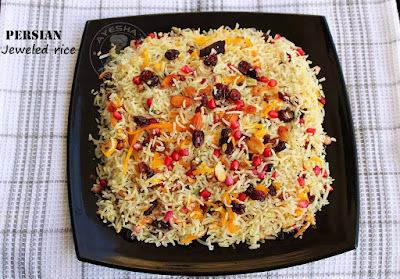 Persian jeweled rice or Morasa polow, which is known as the king of all persian dishes. This is my first try on persian cuisine. An adorned rice dish with dried fruits and nuts that act as a jewel in this dish. Morasa polow / jeweled rice is very easy to prepare and looks attractive even in a crowd. This dish is prepared during special occasions in persia like weddings, Nowruz (persian new year) etc. Morasa polow is sweet in taste because of the sugar used in most of the ingredients. I am not a fan of sweet rice dishes but that doesn't matter for me in this rice dish. 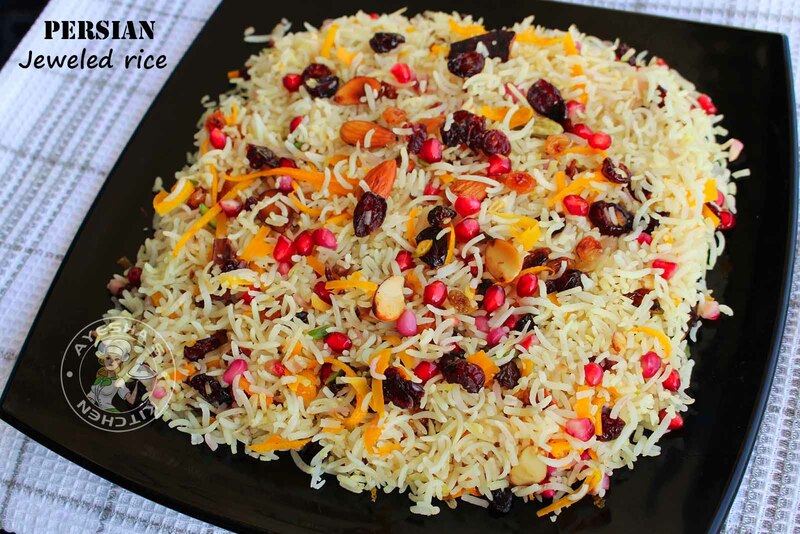 A special rice recipe that is different in taste and beauty. The beauty of this dish itself makes me feel hungry. Cranberries or Barberries (dried tart berries with intense red color) are preferred for making jeweled rice. Or you can use fresh pomegranate seeds also. Here i used pre - cooked basmati long grain rice (or boil the rice in salted water until it soft but must be slightly crunchy. Stir well to ensure grains are fully separated and then strain and set aside). Heat butter in a non stick pan. Saute dried cranberries, raisins, almonds, pistachios for a while and set aside. To the same pan, again add butter. Saute onion along with cardamom, cinnamon, cloves and cumin seeds. Saute until onion turns soft. Then add yogurt and combine well. Add salt. When done, add the cooked rice. Mix well. Sprinkle turmeric mixed water or saffron mixed milk over it. Finally layer with the butter toasted dry fruits and nuts along with the candied orange rinds, carrot strips(check below for recipe). 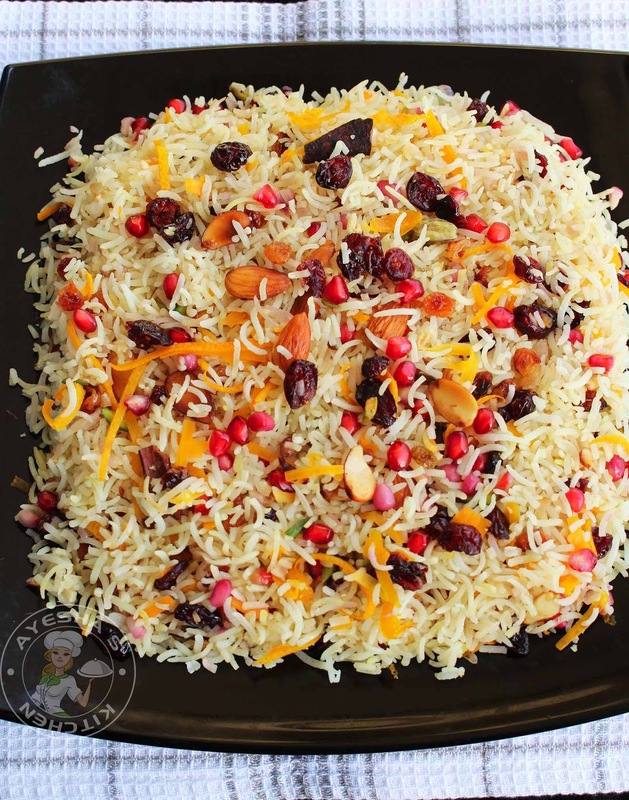 (You can make dum by spreading some rice as the bottom layer, top with some nuts, then again rice , finally with nuts ). Cover and cook over a low flame for 5 - 10 minutes. Garnish with pomegranate seeds and toasted nuts . Serve hot. Peel the rind of orange (orange peel), discard the white under layer (it tastes bitter). Then make long strips. Set aside. Peel the carrot skin and continue peeling the flesh for making thin strips. (using a mandolin or a knife ). Set aside. Boil 3 cups of water. Add carrot strips and orange rind strips. Bring to boil and then strain(to get rid of rind's bitterness). Boil quarter cup of sugar with quarter cup of water. Add the orange rind strips and carrot strips. Boil for 10 minutes and strain. This candies the orange rind and carrot strips partially.